Chamber CEO Paul Farmer shares this: "I've been to this area before and Iguazu Falls is one of the most phenomenal things I've seen in my life. I'm super excited to go back and to be able to share this spectacle with our travelers." 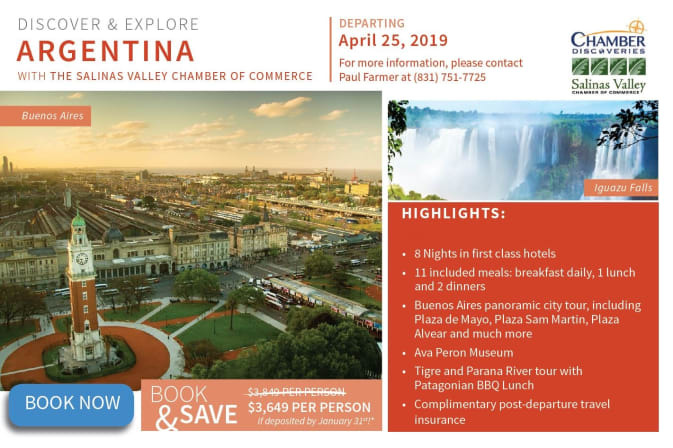 If you're new to traveling with the Chamber, it's a fantastic way to see the world with someone you trust and our group travel rates will save you plenty of dough and headache. The Chamber and our travel partner agency handle all the details so the hardest work you have to do is enjoy your vacation. This particular trip will be limited to about 40 people on our own private motorcoach (doesn’t that sound more luxurious than a bus?). You get to make new friends and we’re all happy because hello…we’re on vacation! We stay in beautiful 4-star hotels, with many meals included. A professional tour guide accompanies us on the trip, takes care of the logistical details and shares with us the background and histories of the places we visit. Questions that can’t wait? Please email or call Paul (831-585-1282 or President@SalinasChamber.com) and he'll get ya squared away.